Two things I really love doing here on the food blog are developing recipes and taste testing new products. So when I saw that Food Bloggers of Canada had an opportunity to combine the two through a promotion with Pulo Philippine Cuisine, I threw my name into the hat in hopes that I would be one of the selected few. Soon enough, a package of goodies arrived on my doorstep, and I was ready to get creating! Each sauce is full flavoured and well balanced between sweet and sour ingredients. The spice levels range from mild to medium, making them suitable for many palates (and easy enough to spice up if you like it hot). I took a little while to decide how I wanted to use the sauces. Each one comes with basic cooking instructions, which usually looks like marinating your favourite protein source, and making some sort of stir fry dish served with rice. This definitely sounded delicious, but I wanted to cook outside the box. I also wanted to utilize more than one product in my recipe, because I felt like the creamy cooking sauces would pair nicely with sweeter marinades. 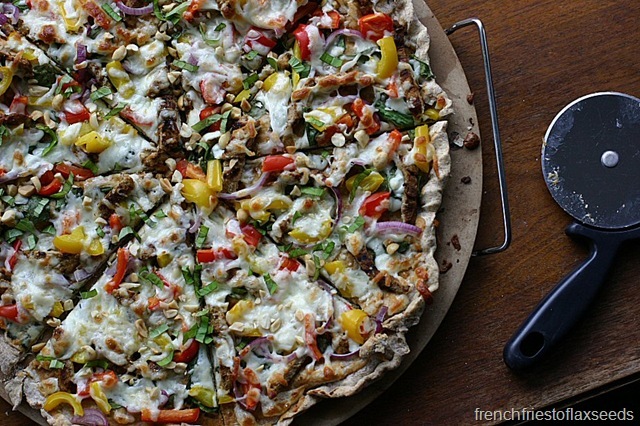 One afternoon, the idea of a tropical pizza popped into my head, and I didn’t look back. After an inventory of the freezer, I saw I had some pork tenderloins, and decided that would be my feature protein. I used the Mango Chili Marinade on my pork, which I grilled up for a pizza topping. I kept the veggies simple – peppers, onions, and spinach – and used the Kare Kare Peanut Sauce in place of the usual tomato sauce on the pizza. My instincts were correct – the pizza was awesome! The marinade was delightful on the pork – sweet yet spicy, keeping the meat moist and tender. The peanut sauce was a fun surprise when eating the pizza, because you couldn’t see it underneath all those toppings and cheese once it was cooked. Yes, I may be a confessed peanut butter lover and slightly biased, but it did really pair nicely with the pork and veggies, and was what really gave the pizza that exotic taste. I topped the finished pizza with some chopped peanuts and thai basil, as well as a squeeze of lime juice, just to kick it up another notch. I would have added some pineapple too, if I didn’t have a picky pizza eater at home, to give it even more of an island feel. But trust me – it was good without it as well. 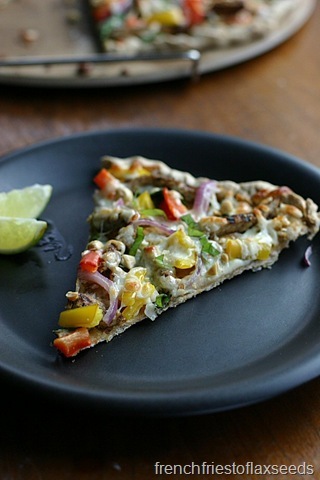 Switch up your usual pizza toppings for this “taste of the tropics” combination of mango chili pork, sweet bell peppers, sharp red onion, and creamy peanut sauce. 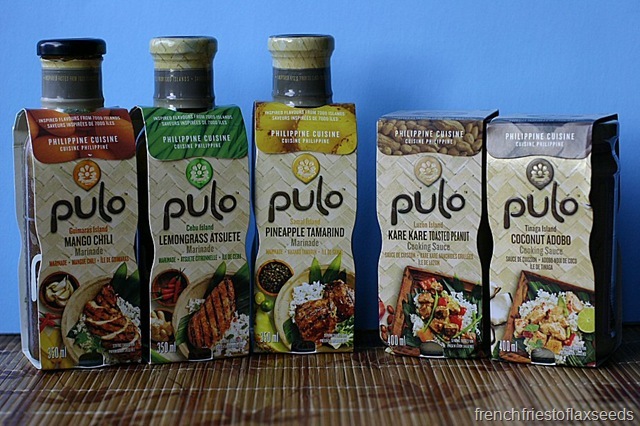 You’ll love the way the flavours play together to take your tastebuds on an exotic journey with the flavours of the Philippine Islands, all courtesy of Pulo Philippine Cuisine marinades and sauces. 1. Combine pork and mango chili marinade in a bowl, and allow to marinate for at least 1 hour. 2. Preheat oven, with pizza stone (if you have one), to 425 degrees F.
3. Preheat a grill pan over medium heat. Remove pork from marinade, and grill in pan until cooked through, flipping once to get grill marks on each side. Remove from pan and set aside. 4. Roll out pizza dough on a floured surface to the size of your pizza stone or baking sheet. Place on pizza stone (remove from oven) or baking sheet. 5. 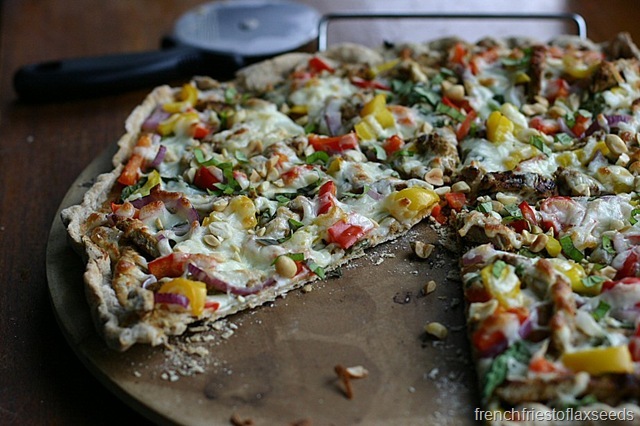 Spread peanut cooking sauce evenly over the pizza dough. 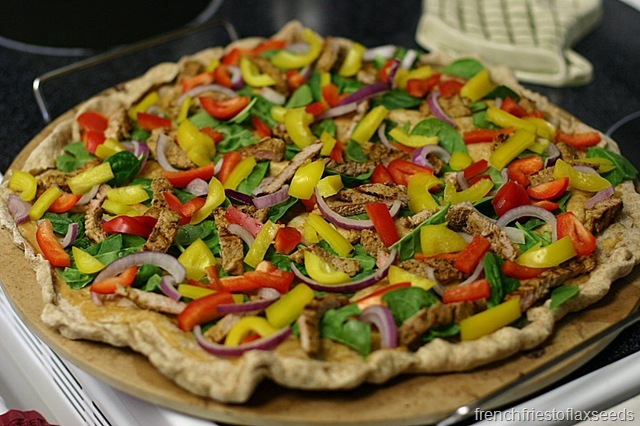 Layer toppings on pizza, starting with spinach as the bottom layer, then pork, onions, and peppers. Top with shredded mozzarella. 6. 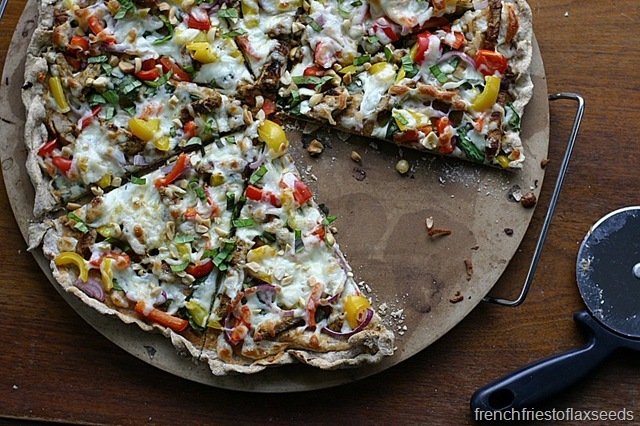 Bake pizza for 12 – 15 minutes, until cheese is melted and starting to brown in places. Remove from oven, and allow to cool for 5 – 10 minutes. Add peanuts and herbs if using, then slice into 8 large slices. Serve with lime wedges. Note: To save time, use your favourite premade pizza shell instead of pizza dough. 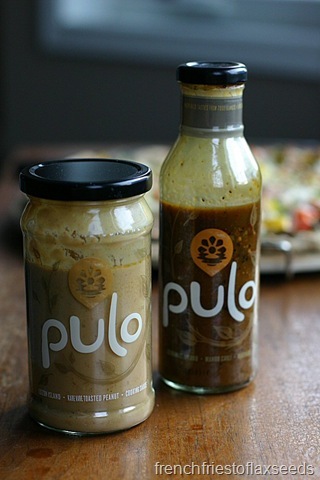 Thanks Food Bloggers of Canada and Pulo Philippine Cuisine for the opportunity to try out your delicious sauces and marinades. They are a welcome addition to my kitchen, and I look forward to trying out the rest of the line. It will be great to have that taste of the tropics, especially once winter is upon us! Disclaimer: These products were provided to me free of charge to participate in this blogger promotion. All opinions are my own. I could definitely make the BF pizza everyday with no complaints. But I think he would prefer a more traditional pie most of the time.